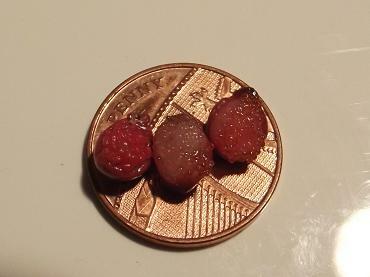 I tried to make itty bitty 12th scale pomegranates. My absolute best friend and I were reminiscing about having pomegranates as a special treat when we were small children... and eating them with a pin, seed by jewel-like seed. So... 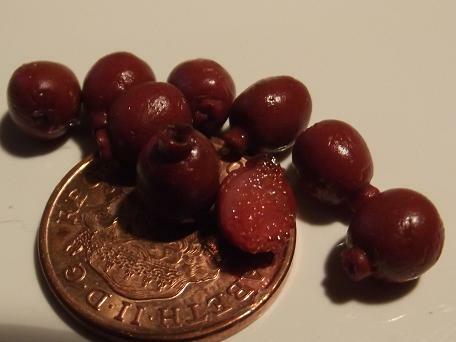 I mixed a pomegranate-like colour, then halved it with transluscent clay... but they still came out a little dark. I don't know if I have the patience to try them again though *lol*. They look quite bland... but the amount of time these took was amazing - blending chalks and getting the king-flute on the top (don't know why we called it the king-flute... but we did and that's just how it is *lol*)... maybe more transluscent? I attempted the halved pomegranate several times before ending up with something I was slightly happy with. First, I tried to roll (by hand) some teeny seeds - they weren't opaque enough, Next I tried glass marbles with a little adirondak inks for colour - not enough ink. Lastly (and best) I tried the glass marbles with a lot more ink, and the result was a bit more satisfactory. I may try these again... maybe. Angela has some great free tutorials - also find her on you-tube... Garden Of Imagination.